Adam Anderson & Eve De Rosa – What’s in a feeling? Adam Anderson and Eve De Rosa from the Affect and Cognition Lab at Cornell share state of the art research methods about psychological and neural foundations of emotion and cognition. From animal models to magnetic resonance imaging (MRI), the public will get an idea of how scientists attempt to understand the nature of affection. Furthermore, Ursula Hess will draw from her research on the communication of emotions to discuss whether emotions are universally understood or culturally dependent. Joachim Muller-Jung, Head of Science at F.A.Z. Posted in Multimedia and tagged Adam Anderson, Affect and Cognition Lab, cognition, cornell university college of human ecology, emotions, Eve De Rosa, human development, Human Neuroscience Institute, MRI, neuroscience on June 9, 2017 by Allison M. Hermann, Ph.D.. Although feelings are personal and subjective, the human brain turns them into a standard code that objectively represents emotions across different senses, situations and even people, reports a new study by Cornell neuroscientist Adam Anderson. “We discovered that fine-grained patterns of neural activity within the orbitofrontal cortex, an area of the brain associated with emotional processing, act as a neural code which captures an individual’s subjective feeling,” says Anderson, associate professor of human development in Cornell’s College of Human Ecology and senior author of the study, “Population coding of affect across stimuli, modalities and individuals,” published online June 22 in Nature Neuroscience. Their findings provide insight into how the brain represents our innermost feelings – what Anderson calls the last frontier of neuroscience – and upend the long-held view that emotion is represented in the brain simply by activation in specialized regions for positive or negative feelings, he says. “If you and I derive similar pleasure from sipping a fine wine or watching the sun set, our results suggest it is because we share similar fine-grained patterns of activity in the orbitofrontal cortex,” Anderson says. “It appears that the human brain generates a special code for the entire valence spectrum of pleasant-to-unpleasant, good-to-bad feelings, which can be read like a ‘neural valence meter’ in which the leaning of a population of neurons in one direction equals positive feeling and the leaning in the other direction equals negative feeling,” Anderson explains. For the study, the researchers presented 16 participants with a series of pictures and tastes during functional neuroimaging, then analyzed participants’ ratings of their subjective experiences along with their brain activation patterns. To crack the brain’s emotional code and understand how external events come to be represented in the brain as internal feelings, the researchers used a neuroimaging approach called representational similarity analysis to analyze spatial patterns of brain activity across populations of neurons rather than the traditional approach of assessing activation magnitude in specialized regions. Anderson’s team found that valence was represented as sensory-specific patterns or codes in areas of the brain associated with vision and taste, as well as sensory-independent codes in the orbitofrontal cortices (OFC), suggesting, the authors say, that representation of our internal subjective experience is not confined to specialized emotional centers, but may be central to perception of sensory experience. They also discovered that similar subjective feelings – whether evoked from the eye or tongue – resulted in a similar pattern of activity in the OFC, suggesting the brain contains an emotion code common across distinct experiences of pleasure (or displeasure), they say. Furthermore, these OFC activity patterns of positive and negative experiences were partly shared across people. “Despite how personal our feelings feel, the evidence suggests our brains use a standard code to speak the same emotional language,” Anderson concludes. The study was funded in part by a postdoctoral fellowship from the Japan Society for the Promotion of Science and was co-authored by Junichi Chikazoe, postdoctoral associate in human development at Cornell; Daniel H. Lee, University of Toronto; and Nikolaus Kriegeskorte, University of Cambridge. Posted in Features and tagged emotions, neuroscience on July 24, 2014 by ktb1@cornell.edu. Why do our eyes open wide when we feel fear or narrow to slits when we express disgust? According to new research, it has to do with survival. Cornell neuroscientist Adam Anderson and colleagues concluded that expressions of fear and disgust altered the way human eyes gather and focus light. 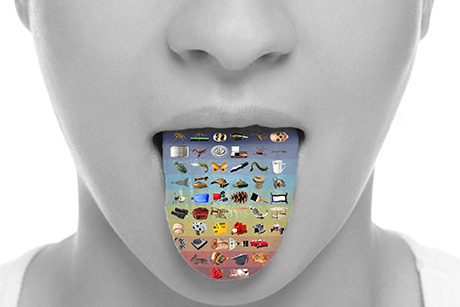 Posted in Articles on the Web and tagged emotions, neuroscience on July 24, 2014 by ktb1@cornell.edu. Posted in Articles on the Web and tagged emotions on July 24, 2014 by ktb1@cornell.edu. Why do we become saucer-eyed when afraid and taper our eyelids to slits when disgusted? These near-opposite facial expressions are rooted in emotional responses that exploit how our eyes gather and focus light to detect an unknown threat, found a study by a Cornell neuroscientist. In fear, our eyes widen, boosting sensitivity and expanding our field of vision to locate surrounding danger. When repulsed, our eyes narrow, blocking light to sharpen focus and pinpoint the source of our disgust. The findings by Adam Anderson, associate professor of human development in Cornell’s College of Human Ecology, suggest that human facial expressions arose from universal, adaptive reactions to environmental stimuli and not originally as social communication signals, lending support to Charles Darwin’s 19th-century theories on the evolution of emotion. Anderson and co-authors described these ideas in the paper, “Optical Origins of Opposing Facial Expression Actions,” published in the March issue of Psychological Science. For the experiment, Anderson, with collaborators at the University of Toronto and the University of Waterloo, used standard optometric measures to gauge how light reached the retina as study participants made fearful, disgusted and neutral expressions. Looks of disgust resulted in the greatest visual acuity – less light and better focus; fearful expressions induced maximum sensitivity – more light and a broader visual field. What’s more, the paper notes, emotions filter our reality, shaping what we see before light ever reaches the inner eye. Essentially, our eyes are miniature cameras, constructed millennia before humans understood optics, said lead author Daniel Lee, Ph.D. student at the University of Toronto, where Anderson previously taught. “As automatic actions accompanying our emotions, it means that Mother Nature had solved and programmed within us this fundamental optical principle,” Lee added. Anderson’s Affect and Cognition Laboratory is now studying how these contrasting eye movements may account for how facial expressions have developed to support nonverbal communication across cultures. Posted in Features and tagged emotions, neuroscience on March 27, 2014 by ktb1@cornell.edu. Some people are genetically predisposed to see the world darkly, according to a study from the laboratory of a researcher now on the faculty of Cornell’s College of Human Ecology. 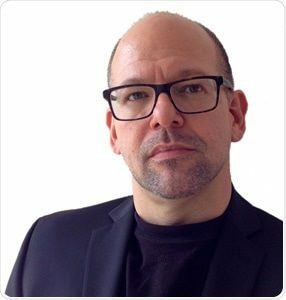 Adam K. Anderson, associate professor of human development, is continuing his research on emotions, genetics and perception, which began at his laboratory at the University of Toronto in collaboration with scientists at the University of British Columbia (UBC). Their study, published in September in Psychological Science, found a previously known gene variant causing some individuals to perceive emotional events – especially negative ones – more acutely than others. The gene in question is the ADRA2b deletion variant, which influences the neurotransmitter norepinephrine. Previously found to play a role in the formation of emotional memories, the new study shows that the ADRA2b deletion variant also plays a role in real-time perception. Some 200 study participants were shown positive, negative and neutral words in a rapid succession, each at 1/10th of a second. While all individuals perceived positive words better than neutral words, participants with the ADRA2b gene variant were more likely to perceive negative words than others. The findings shed new light on ways in which genetics – combined with other factors such as education, culture and moods – can affect individual differences in emotional perception and human subjectivity, the researchers say. Future work on this topic in Anderson’s laboratory intends to examine whether individuals with these very same genetic variants, depending on their environment and stage of development, can be coaxed to enhance perception of the positive rather than the negative. The study, “Genes for Emotion-Enhanced Remembering Are Linked to Enhanced Perceiving,” was funded in part by the Canadian Institutes of Health Research. Posted in Features and tagged emotions, genetics on January 23, 2014 by ktb1@cornell.edu. Recent scientific advances demonstrate the profound effects of emotion on physical health, even how long we live and what diseases we die from. Likewise, there is growing evidence for the effects of aging on our emotions. Both streams of research shed light on root causes of disease and pathways to lifelong health, which is why researchers gathered on campus Oct. 3-4 to better understand the interplay between emotions and health across the lifespan. The Fourth Biennial Urie Bronfenbrenner Conference, “New Developments in Aging, Emotion and Health,” drew scholars from as far away as Europe to share research on the nature of age differences in emotions, how emotions influence health, the underlying biological and behavioral mechanisms, and possibilities for leveraging these discoveries to promote healthy aging. “We convened a temporary think tank of long-standing and rising leaders in the two fields to create some unlikely encounters and novel ideas,” said Corinna Loeckenhoff, assistant professor of human development in the College of Human Ecology and director of the Cornell Healthy Aging Laboratory. “We expect the intellectual exchange and networking will lead to new conceptual developments as well as policy and translation opportunities with real-world implications,” she said. 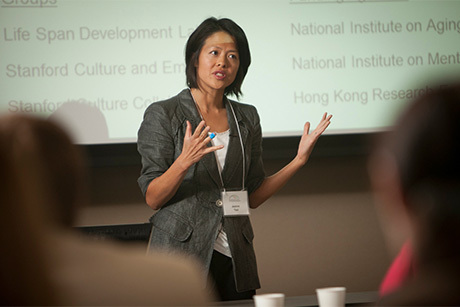 Loeckenhoff co-organized the conference with Anthony Ong, associate professor of human development. Many of those who participated are pioneers in their fields. Laura Carstensen, a professor of psychology and the founding director of the Stanford Center on Longevity, for example, is best known for her theory about how people’s motivations change as they age. She reviewed her recent research on leveraging older adults’ preference for the positive to improve health behaviors. Positive messages about the benefits of exercise, it turns out, are more effective than negative messages about risks of inactivity in motivating older adults to walk regularly. Such insights could revolutionize efforts to help America’s growing population of older adults remain active, she said. Cornell neuroscientist Adam Anderson, associate professor of human development, said that his research suggests that positive emotions are associated with increased cognitive flexibility and creative problem solving, and this may be due to neural changes that impair selective attention. The aging brain, he says, exhibits this same “leaky filter” pattern. More information can slow down thinking, but there’s an upside as well, he proposed – the rose colored glasses of positivity broaden our field of view and help us see remote connections. Alex Zautra of Arizona State University, who studies resilience and interventions that help people bounce back from stressors and adversity, shared his recent research on the crucial role of social ties in “unlocking” resilience and his initiative to develop online social intelligence training to help people build and maintain social ties. Participants (who included other renowned scholars such as George Bonanno, Columbia University; Michaela Riediger, the Max Plank Institute for Human Development; and Laura Kubzansky, Harvard School of Public Health) also debated core assumptions about emotional regulation and personality, the effects of culture, environment and technology, and their implications for policy and practice. The American Psychological Association plans to publish a book based on the papers presented at the conference, which was sponsored by Cornell’s Bronfenbrenner Center for Translational Research, Institute for the Social Sciences and Department of Human Development; the Scientific Research Network on Decision Neuroscience and Aging; Constance F. Ferris; and Liese Bronfenbrenner. Posted in Features and tagged aging, emotions, translational research on October 16, 2013 by ktb1@cornell.edu. Being in the minority in an ethnically diverse crowd is distressing, regardless of your ethnicity, unless you have a sense of purpose in life, reports a Cornell developmental psychologist. Anthony Burrow, assistant professor of human development in the College of Human Ecology, led the study, which was conducted on Chicago trains. The findings shed light on how people encounter diversity in everyday settings at a time when the United States is more racially mixed than ever, with demographic trends pointing to a more multicultural melting pot in decades to come. In two experiments, college students reported their mood as they rode a train from Chicago’s North Side toward the city center for 14 consecutive stops, while Burrow’s team privately recorded naturally occurring changes to the overall ethnic and gender makeup of the car’s passengers during the trip. For the first study, all 111 participants filled out a short questionnaire to assess their life purpose prior to boarding. In the second study, before riding, half of the 116 participants completed a 10-minute writing exercise about life purpose, while the others responded to a question about movies. Participants’ negative mood heightened as the ratio of people from different ethnic backgrounds aboard the train increased, regardless of their own race and after controlling for various factors, such as an individual’s personality, familiarity with metro trains and perceived safety of the surrounding neighborhoods. In both studies, however, those who had a sense of purpose or had written about their life aims did not experience the worsened mood associated with riding among a diverse crowd. But the negative feelings vanished in purpose-driven individuals. Burrow, whose research focuses on the value of purpose, particularly among teens and young adults, suspects that it enabled participants to look beyond themselves to appreciate their role in the world and to build the psychological resilience necessary to overcome adversity. Burrow warned that the study should not be misread as rejecting multiculturalism, even if diversity can be distressing for people. The study, “Derailed by Diversity? : Purpose Buffers the Relationship Between Ethnic Composition on Trains and Passenger Negative Mood,” was published online Aug. 27 in Personality and Social Psychology Bulletin and was co-authored by Patrick Hill of Carleton University. Posted in Features and tagged emotions, resilience on October 16, 2013 by ktb1@cornell.edu.